The UK’s Guardian newspaper gave away 100,000 new virtual reality (VR) headsets to readers in its October 7th publication. This promotion was meant to draw attention to the newspaper’s new mobile app, which will allow users to experience various stories in a VR format. 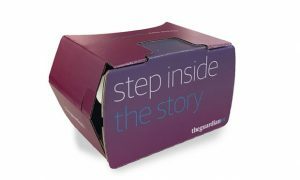 In addition to handing out over 100,000 VR headsets, the Guardian also released their first VR story via the mobile app. This story, called “The Party,” is told from the perspective of an autistic teenager at her mother’s birthday party. Today, the Guardian has its own VR team with five employees. This makes the Guardian (along with the BBC) one of the first major UK news publications to invest heavily in VR storytelling. One of these immersive experiences is a chilling story called “6×9.” In this VR experience, viewers can get a sense of what it’s like to live every day in solitary confinement. All of the headsets released with Saturday’s Guardian publication were made of cardboard. The Guardian worked hard with designers at Google to develop headsets that can fit comfortably on a person’s face and work with the most popular smartphones. Besides the Guardian, a few other major news agencies are interested in VR technology’s potential for the future of journalism. A few organizations that have already created some great VR content include the BBC and the New York Times. In recent years, the number of people purchasing VR headsets was actually higher than people buying tablets in most countries. A recent study put out by research firm Yougov found that about 6 percent of UK households now have at least one VR product. Of course, the majority of people purchasing VR headsets are getting cheaper smartphone applications. Today, about 80 percent of the VR industry is related to mobile-enabled VR technology. A few of the most popular products include the Samsung Gear and the Google Cardboard. Despite the prevalence of these cheaper VR headsets, high-end VR products are also getting more popular around the world. For example, the Playstation VR headset now owns roughly 10 percent of the UK VR market. Just for perspective, the standalone Playstation VR headset can cost roughly £250, but a Google Cardboard only costs £10. The Guardian is one of the oldest and most prominent center-left daily newspapers in the UK. Originally called the Manchester Guardian when it was founded in 1821, the Guardian is now owned by Scott Trust and has two sister papers. Guardian Media Group is headquartered at Kings Place, London. Anyone can download the Guardian’s free VR app onto Android or Apple devices.